Living in London it is impossible not to be both aware and very concerned over the level of serious knife crime, especially among young people. So far this year alone there have been 21 fatal stabbings of people under 21. Yesterday was the funeral of Ben Kinsella and Londoners took to the street to show their concern. 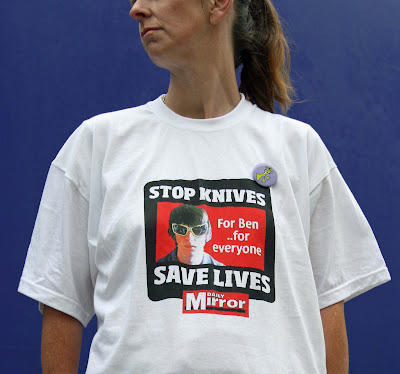 Ben's family have set up a website to raise funds for awareness campaigns. I note that murder is not so unique to America after all. I had "no" idea that the UK had any problems with murder until I read your post about your serious knife crimes. Did the youngsters choose knives because there is less punishment if you murder by stabbing as compared to shooting? I followed your links listened and watched the video about Ben Kinsella, a handsome young man, and read about the fund raising efforts. I've read a few news stories over here about the rise in stabbings in London. So very sad when young lives are shortened by violence. Such a waste. Here's hoping the concerted efforts of Londerers result in a positive solution. It's not just London that has the problem. Here in Nottingham there has been about 1 stabbing a week this year. I suppose it sadly makes a change from the many shootings of 2007. When people want to hurt each other, it seems there is always a way. The Uk really has to wake up to what is happening, not just with young people but with society in general. I moved from the UK to the Isle of Man 5 years ago, and we could see the way the UK was heading. Whenever I visit now I feel ill at ease, when I used to feel so free. Apologises that you are photographing our beautiful, vibrant, wonderful capital city in such troubled times. Keep those fresh eyes safe. I remember wandering around parts of Glasgow in the late 60s and wondering if I was really safe - then it seemed to be gangs fighting amongst themselves and to an extent that is still is case. We all thought the gun problem might improve after the Dunblane incident but it didn't really. I'm sorry if I sound a little pessimistic, on the other hand I do think we should not let fear get the upper hand. it's good to see that t-shirt. Life is so precious and it's such a tragedy to see young people killing each other like this.